Back in March, we reported to you how Anglican priest Tony Palmer, a member of the Roman Catholic Ecumenical Delegation for Christian Unity and Reconciliation, gave a rousing call to Kenneth Copeland’s church to “return to Mother Rome”. He was met with a hero’s welcome by a very enthusiastic congregation. And just in case you thought that it was a “one off” meeting, you would be sadly mistaken. Pope Francis isn’t selling anything, he’s buying. At their meeting today in Rome, they discussed among other things, the coming alliance of the Roman Catholic church with the Charismatic apostates. This has already been in the works for quite some time, and they feel very confident of making the merger. Of course, at first, it will simply be a “let’s focus on what we have in common” ruse whose mask will be dropped soon after the Charismatics have grown comfortable with the idea. Absorbing the Charismatics and the Pentecostal movements will create the foundation the Vatican needs for their One World Religion. The Vatican’s alliance with Islam has already been established to great success. Just like Rome used the army of Spain as muscle for the Spanish Inquisition during the dark ages, Rome will use the blood-thirsty Muslim terrorists of Islam to regain control in our day. 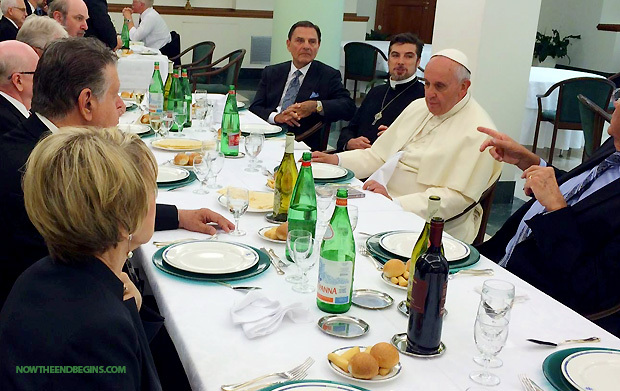 Joel Osteen has already met with Pope Francis, and is a huge supporter of his efforts. The Roman Catholic Church brags constantly that they have “never changed”, and that is true. The Vatican that exists today is exactly the same demonic system that began the Spanish Inquisition to kill Christians back then. As Ecclesiastes says, that which has already been, is the thing that shall be. "Pathetic. The reality is they are destroying the future everywhere else and doing it on OUR dime." "a white dude? hell i had a different image in my head! ANTIFA?" dogitydog replied to Raz Putin's discussion ActivistPost:" President Trump, FCC Chairman, Ivanka Trump Promote Forced 5G Installation Despite Lawsuits, Municipal Opposition and No Studies Showing 5G Is Safe"
"Great website Gralton! Thanks for posting it."